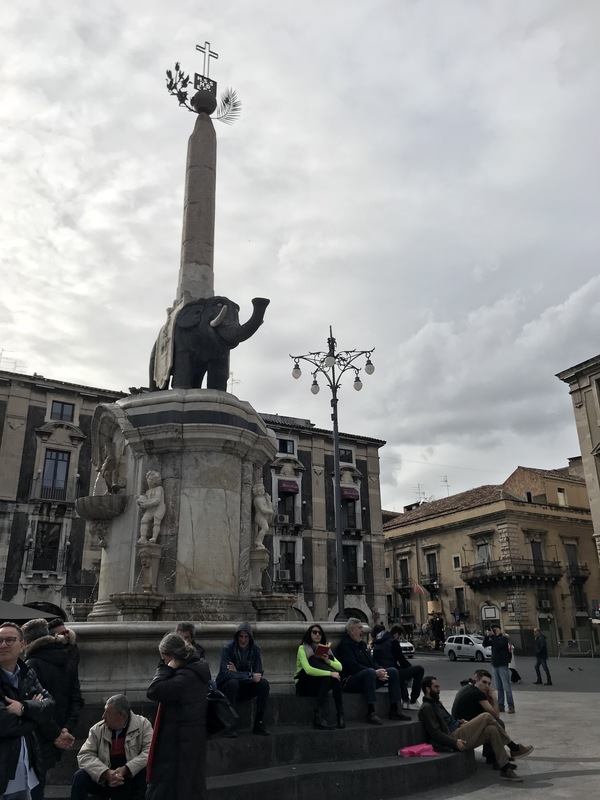 Piazza Duomo holds not only Catania’s cathedral (whose exterior, like many other buildings and cobblestones throughout the city, is built from volcanic rock), but also this obelisk holding an elephant, what has become an emblem of the city. Bringing to mind a similar elephant structure in Rome, the obelisk serves as another reference of the many invaders that have come to define Sicily (just as the landscape, in the form of volcanic rock, has also defined Sicily). 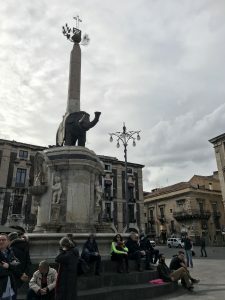 Moreover, the Sicilians’ name for the elephant obelisk—“Liotru”—references Elidoro, an eighth-century magician who tried to bring the elephant to life. This idea of the magic or mysticism of Sicily that we have talked about in class fully manifests itself here, particularly in the way another legend takes shape about the elephant: according to a twelfth-century geographer, the statue kept the city safe from Mount Etna, an theory that would prove untrue with Etna’s later damaging effects on Catania. 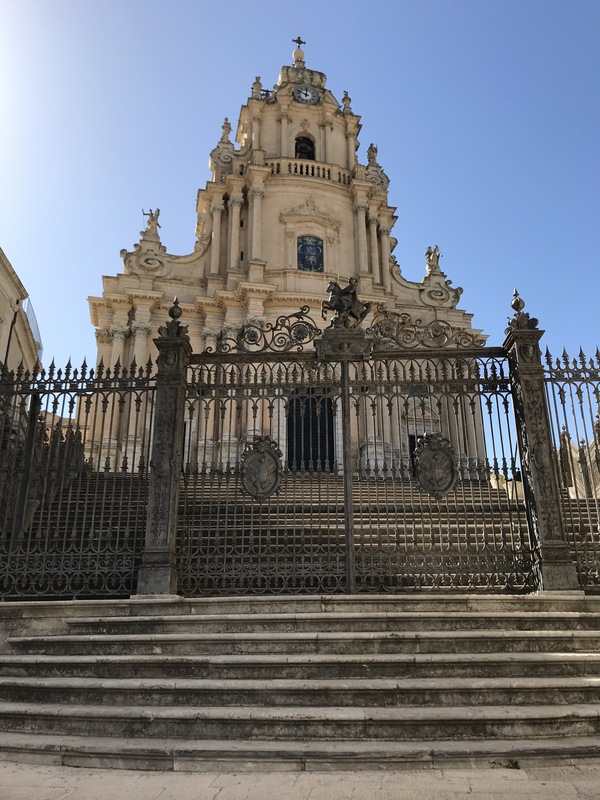 After the earthquake of 1693 destroyed much of Ragusa, Noto, and Catania (among many other parts of eastern Sicily), these towns and cities entirely rebuilt themselves. Much of this new architecture was in the baroque style (like the cathedral of Ragusa, pictured above), a sharp contrast from many of the other sites of antiquity we saw throughout the rest of the trip—yet another display of the many conflicting styles and cultures within Sicily. 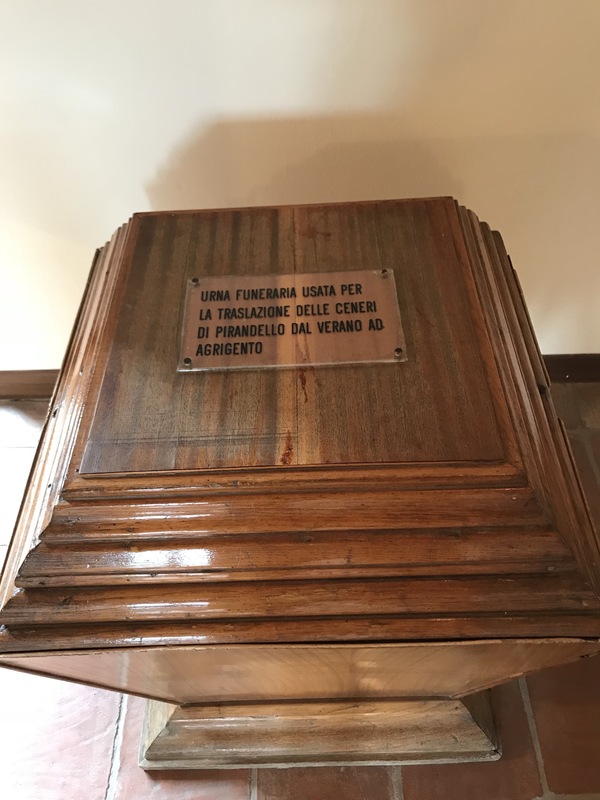 Each of the authors’ sites we’ve visited over the trip have memorialized their legacy in a different way. While Lampedusa’s home has become a guided tour and residential space and Sciascia’s hometown a host of his museum and statue, Pirandello’s home had been turned into a museum and a space for his tomb. Pirandello, the master of the school of thought that life just puts us into all these different forms, we can never truly be ourselves unless we go “crazy,” asked for a no-frills funeral—turns out he got three funerals and an abstract tomb/memorial in the backyard of his former house, which now displays all his documents, manuscripts, and family’s paintings. 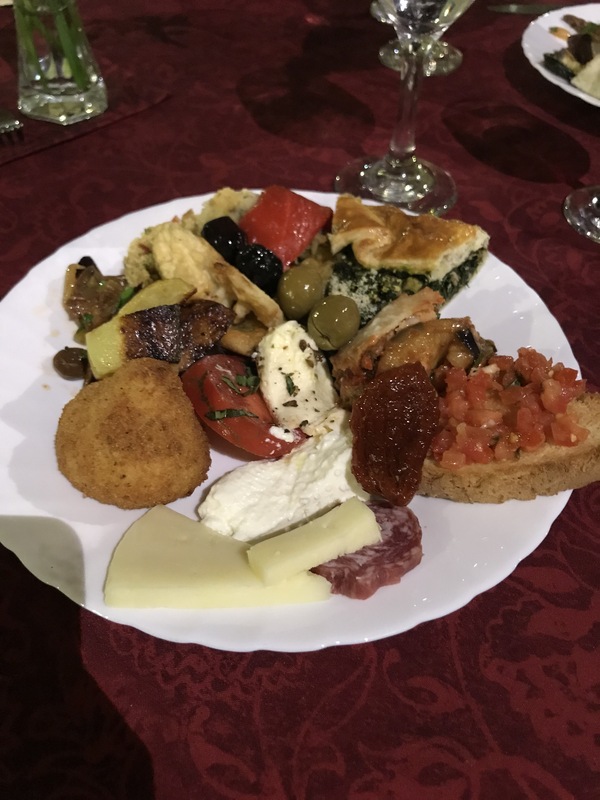 At cooking lessons with Maria Grammatico we learned to make Brutti ma buoni, Tette delle monache, marzipan, and cannoli, before eating a feast of Sicilian foods (as pictured above). Maria was a skilled, rather sassy Sicilian chef, with an unusual professional training: she learned to make pastries in a convent, where she grew up after her mother couldn’t afford to feed all her children in the wake of WWII. Now, Maria not only has her own bakery, but also a cookbook published in multiple languages and her own cooking school, where her staff flocked around her like doting grandchildren. The fog that covered Erice that night only added to the otherworldliness of the experience. 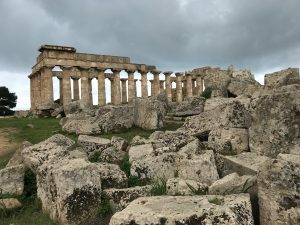 The temples of Selinunte were my favorite of the trip because of how much access we had to the space. Unlike some of the other ancient sites we saw, Temple E, F, and G were open to the public; we could walk inside the still preserved shape of Temple E and climb over the remains of Temple G. The idea of restoration and access continually popped up throughout our exploration of these ancient sites—does preservation mean adding things to a site to make it like what it once was or leaving it be, thereby vulnerable to the effects of time? These conflicts tie in too with the idea of ownership—who should be making these decisions? As I climbed up the rocky remains of Temple G and saw two temples in the distance, farmland, the water, it was easily to imagine feeling that this space was my own, an illusion of possession that so many people have felt about Sicily over the years.